Re-configured from the bottom up, the 2014 Mazda6 is now a better choice to compete with the likes of the Big 3 (Ford, Honda, Toyota). More stylish than its predecessor, the Mazda6 is now equipped with Mazdaâ€™s i-ELOOP regenerative braking system. In response, fuel economy is increased substantially. Competing with the 2014 redesigned Mazda6 are the ever-popular Honda Accord, Nissan Altima, Ford Fusion and Toyota Camry. Formidable competitors, yet not offering much that is different. The redesigned, much improved 2014Mazda6 offers something a little different, sportiness for one. This change, along with a lengthened wheelbase has also created great interior room, better accommodating rear seat passengers. Â The dashboard has been reconfigured, creating a more modern look and feel. Compared to other sedans, the controls and buttons on the Mazda6â€™s stereo system are small.Â The center display screen (5.8 in.) seems smaller than some, and their navigation system sports rotary-style knobs. Not as easy to operate as others. The usual technology is featured: Bluetooth smartphone, Pandora radio compatibility, Sirius/XM, HD radio and AUX and USB inputs. Those drivers into texting will enjoy this function also, with incoming texts read aloud and available recipient response made through voice commands. 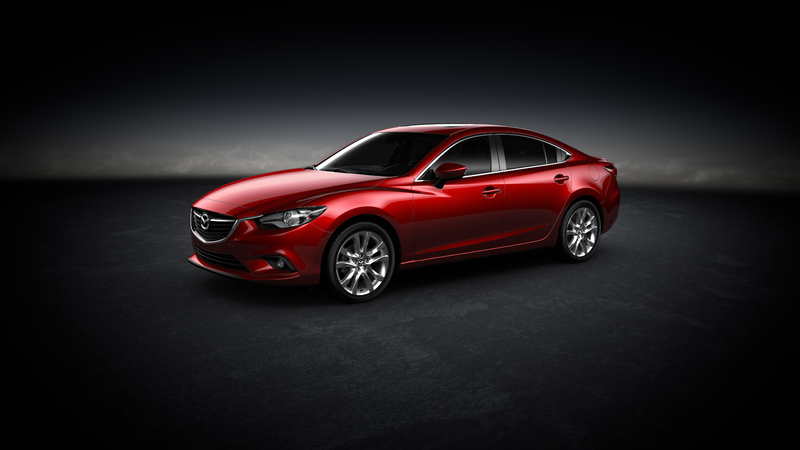 The second vehicle in Mazdaâ€™s lineup to be designed from the ground up, the Mazda6 utilizes SkyActiv technology, which in part, helps to reduce weight, make the vehicle tighter and tauter (by 30 percent) and improving safety and handling. Â A regenerative system, i-ELOOP recaptures kinetic energy usually lost during braking. The energy is stored in a capacitor and utilizes it to power electric components. Our Grand Touring model is also available with the GT Technology package and adds a Lane Departure Warning System, High Beam Control, Mazda Radar Cruise Control, Forward Obstruction Warning and i-ELOOP. Of course, the latest safety features come standard on the new Mazda6, and include dual front, front side and full-length side curtain airbags in addition to a tire-pressure monitoring system. The Touring and Grand Touring trim levels feature a blind spot warning system and rear cross traffic alert, which alerts the driver to obstacles when the sedan is in reverse. Standard on the Grand Touring is a Smart City Brake system that employs a laser sensor system to detect potential collisions, send a warning to the driver and even apply (a little unnervingly!) Â the brakes to mitigate the severity of a crash. The system operates at speeds up to 20 mph. 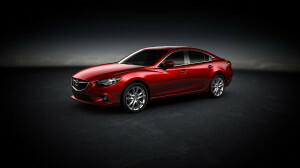 The new Mazda6 offers a quiet, comfortable ride, generous interior room and style. Much-improved over previous generations. EPA fuel tank capacity: 16.4 gal. Replacing both Cadillacâ€™s DTS and STS luxury models, the all-new 2013 Cadillac XTS is a spacious, high-tech ride, complete with all the goodies available and available all-wheel-drive. A strong contender in the full-size luxury segment, intends to compete with some of the luxury German models. The good news is the XTS, as well as other new Cadillac models, does not have much resemblance to Caddies of the past: large cruisers with floaty rides. The XTS has a tight feel, with a firm, yet comfortable ride and much of the sportiness of the imports. A spacious cabin with state-of-the-art materials, multimedia interface/technology, available all-wheel drive and several available safety features make the new XTS a desirable luxury sedan. If we have to point out any â€˜cons,â€™ they might include a somewhat less-than-spirited acceleration, and learning curve for buyers who may not be so high-tech. The Cadillac XTS is available in four trim levels: Base, Luxury, Premium and our test-model, Platinum. All with the same V-6 engine. The XTS rides on the same platform used on the Buick LaCrosse, yet more youthful in feel and appearance. Although not positioning the XTS as its â€˜flagship,â€™ Cadillac Â appears to be competing with the German luxury sedans. What XTS does represent is an automotive manufacturer that has transformed itself from frumpy to stylish and desirable. GMâ€™s V-6, 3.6-liter engine is the only engine available in all four trim levels. Even with 304 horse, though, It isnâ€™t as fast as weâ€™d like. We might expect more than 28 mpg., from in a GM product, but then the XTS is a large car with considerable weight. The XTSâ€™ exterior is stunning, in its square-ish shape. Vertical headlights, a massive Caddy grille and creased panels give it the Cadillac style and recognition. The interior is up-to-date with a great looking IP providing all kinds of data and the CUE system which takes some time to learn. It took this writer a few drives to figure out the touch-sensitive system display when attempting to manipulate the audio and systems. Something in the driverâ€™s seat kept vibrating on/off. We finally figured out this is part of the optional Driver Awareness System which also features adaptive cruise and low-speed automatic braking. As with most, if not all, luxury sedans, the XTS comes fully equipped, from the Base model on up to the overloaded Platinum edition. Such features as adaptive suspension dampers, xenon headlamps, leather upholstery and dual-zone climate control are available on the XTS Base. Safety features include driver/passenger airbags, frontal, knee/head curtain/side airbags, rear head curtain/side impact bags, theft deterrent system. We especially enjoyed the driver awareness radar system that warns the driver if it detects a lane change or possible sideswipe. Also standard is OnStar, which includes automatic crash notification, on-demand roadside assistance, remote door unlocking, stolen vehicle assistance and turn-by-turn navigation. Standard features on the XTS include 19-inch wheels, adaptive suspension dampers, xenon headlamps, heated mirrors, rear parking sensors, keyless ignition/entry, dual-zone automatic climate control, 10-way power front seats (with power lumbar control), a power tilt-and-telescoping steering wheel, and leather/faux-suede upholstery. Standard electronic features include Bluetooth phone and audio connectivity, an 8-inch center touchscreen, OnStar and an eight-speaker Bose sound system with a CD player, satellite radio, HD radio, iPod/USB connectivity and an auxiliary input. Our test model, the Premium Collection package adds to the other models with 20-inch snazzy wheels, unique exterior styling, a very generous sunroof that when open almost feels as though youâ€™re in a convertible. Of course, the interior seating is leather and trim on the A, B panels covered in soft trim. Options on our model included Driver Assist Package ($2,395) and Black Diamond Tricoat ($995). Competing also with the likes of the Chrysler 300C, Hyundai Genesis and Lincoln MKS, the Cadillac XTS offers features right up there with the best of them. For the consumer coming back to the brand (or never having left), Cadillacâ€™s â€˜newnessâ€™ and high-tech features may/may not be off-putting. Head and leg room is ample in the XTS, and trunk room is cavernous (18 cubic feet). While a good size sedan, driving the XTS doesnâ€™t translate that way. Itâ€™s manageable and handles well. Steering is sharp and the cabin very quiet. The ride although firm (which this writer prefers) is comfortable. Warranty: Â 4 yr./50,000-mile bumper-to-bumper, 6 yr./70,000-mile powertrain limited, 4 yr./50,000-mile premium care maintenance, 6 yr./70,000-mile roadside assistance and courtesy transportation. 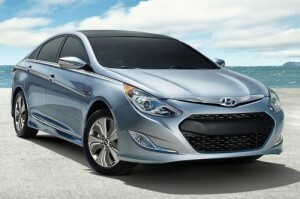 The Sonataâ€™s current design, introduced in 2011, has won over hearts of consumers everywhere. Along with the automakers impressive list of standard features and reasonable pricing, the Sonata is quick becoming the vehicle of choice in the mid-size sedan category. We tested a 2013 Hybrid version, a third powertrain option in the Sonata, with a standard 2.4-liter four with electric motors and a lithium-polymer battery pack. The Sonata Hybrid has a high threshold that enables it to run on battery power alone at highway speeds. According to Hyundai, this version will hit 60 mph in 9.2 seconds, well within the acceptable range for a family sedan, while delivering gas mileage of 36/40 mpg. Just a few changes exist on the 2013 Sonata. In addition to the Sonataâ€™s already impressive list of standard options, compared to its competitors, are Bluetooth, a USB port, power accessories, a tilt/telescoping steering wheel, and cruise control all remain included at the base level, for $21,670. Heated seats have been added this year as a standard feature to the sportier SE model, while SE and Limited editions add parking sensors and pushbutton start. The Sonata Limited also gets standard heated front and rear seats; a sunroof; a backup camera; automatic climate control; and an automatic dimming rearview mirror. And a BlueLink suite of operator-assisted concierge and data services, at different pricing tiers, remains available. There are two trim levels available in the Sonata Hybrid: Base ($25,650) and Limited ($30,550)-new for 2013, both with the same engine. Our test vehicle was a Limited version, wanting for very little. The 2013 Hyundai Sonata Hybrid receives an upgraded electric motor and a lighter, more compact battery, resulting in improved EPA fuel economy ratings and more trunk space. The Limited trim level includes much of the base model’s optional equipment as standard, including 17-inch wheels and a navigation system. All hybrid sedans lose some trunk space due to intrusion from the hybrid system’s battery pack, and the Sonata Hybrid is no exception, with 12.1 cubic feet of capacity compared to 16.4 cubic feet in the regular Sonata. Among hybrid midsize sedans, the Sonata Hybrid offers comparable trunk space to its competitors Fusion Hybrid and 1 cubic foot less than the Camry Hybrid. One wouldnâ€™t be disappointed in trunk size in the Sonata Hybrid, however. We found it to be very accommodating while moving boxes around. Hyundai has also made changes to the computer-controlled clutch between the Sonata Hybrid’s 2.4-liter four-cylinder gasoline engine and its electric motor. This change results in a more smooth transition between the gas and electric power sources in traffic. The lighter, more compact lithium-polymer battery pack allows for extra trunk space, as the Sonata Hybrid goes from just 10.7 cubic feet last year to a respectable 12.1-cubic-foot trunk in 2013. The Hyundai Sonata remains one of our favorite mid-size sedans, and the Hybrid is no exception. A quiet smooth-riding vehicle, itâ€™s hard to find much fault with. The Hybrid version offers good economy, generous interior room, along with the latest technology. We especially liked the music played when turning on/off the vehicle, as well as the diagram on the IP of the battery doing its thing. As with all vehicles, there exist a few â€˜cons;â€™ the Sonata Hybrid is no exception. The steering doesnâ€™t provide much feel and jerks awkwardly at times. Seats could be a little more plush, but with the other abounding value this sedan offers, thatâ€™s a minor complaint. Warranty: 5 yr/60,000-mile New Vehicle; 10 yr/100,000-mile powertrain; 10 yr/100,000-mile Hybrid System Corporate Lifetime Hybrid Battery Replacement Guaranty; 7 yr/unlimited mile Anti-perforation; 5 yr/unlimitedÂ Roadside Assistance. Unchanged for 2013, the CT 200h hatchback/wagon, although a fun vehicle to drive, doesnâ€™t necessarily offer anything unique, although a pleasurable vehicle to drive. As with all Lexus vehicles, the ride is smooth/quiet, the interior comfortable, and fuel economy commendable at 42 mpg. Borrowing heavily from the Prius, the 200h is more fun to drive than last yearâ€™s model, particularly with Lexusâ€™ sport-tuned suspension. The F-Sport package ($1,000) offers quite a few upgrades, making this small wagon a nimble entry-level contender. While it may not be the sportiest in its category, the CT 200h looks more sporty, urban than some of its competitors, namely, Audi A3 diesel, Acura JLX hybrid, BMW 1 series and Buick Verano. The CT 200h pairs an electric drive motor to generate a total system output of 134 horsepower. A second motor in the hybrid system serves as both engine starter and generator to charge the hybrid battery pack. The CT 200h incorporates a drive-mode selector that allows the driver to toggle between four distinct modes: Normal, Sport, Eco or EV. Normal mode has an essentially linear throttle response that provides naturally progressive power. For a sportier, more dynamic output, the Sport mode can be selected. In Eco mode, air conditioning settings are adjusted and the throttle response is reduced relative to the pedal angle to emphasize fuel economy. Under certain circumstances, the EV mode allows for the vehicle to be driven short distances utilizing only the electric motors. Due to the instant torque of the electric motor and the E-CVTâ€™s ability to quickly locate the optimal gear ratio, responsive passing acceleration is available. For 2013, Lexus has updated the Navigation system with next generation Lexus EnformÂ® and Safety ConnectÂ®, App Suite, and HD Radioâ„¢ with iTunesÂ® tagging. The Navigation screen can be kept closed at start up, and a padded driverâ€™s arm rest has been added.Â New exterior colors include Silver Lining Metallic and on those CT 200hâ€™s quipped with the F-Sport package, a new Ultra White color. Park Assist is now available as its own option. Last yearâ€™s premium level is now an optional package on the CT 200h. Standard safety equipment on the CT 200h includes an eight-airbag Supplemental Restraint System w/dual-stage driver and front-passenger airbags and knee airbags, side curtain airbags and front Â seat-mounted side airbags. Optional Pre-Collision System (PCS) with Dynamic Radar Cruise Control can help reduce collision damage and uses millimeter-wave radar to measure and help maintain a pre-set distance from a vehicle traveling ahead. PCS is equipped with a front-mounted radar sensor that is designed to detect certain obstacles in front of the car. Options were plentiful and costly on our test CT 200h and included Premium Package with navigation, 10-speaker Lexus Premium audio system, auto-dimming rearview mirror, Lexus Homelink Universal Transceiver ($890); F-Sport w/NuLuxe interior (F-sportÂ 17â€ alloy wheel, mesh upper/lower grille, larger rear spoiler, black headliner, aluminum spoke pedals-accelerator, brake, footrest, perforated leather trimmed steering wheel, leather trimmed shiftknob, F-Sport exterior fender badges, metal front door sills/scuff plates, metal tone instrument panel trim, sport tuned suspension ($1000); HDD navigation system backup monitor, Lexus Enform with destination assist, eDestination-1 yr trial subscription, Lexus Insider Voice Command, SiriusXM NavTraffic, NavWeather, Sports, Stocks, fuel prices, HQ radio ($2,735); Seat Comfort Package (heated front seats, 4-way power passenger seat ($600); cargo mat ($75); premium floor mats ($280). Available trim levels include CT 200h and CT 200h hybrid F-Sport. Engine: 1.8-liter in-line 4-cyl.DOHC with VVT, Electric drive motor with Lexus Hybrid drive, 134 hp. Warranty: 4 yr/50,000-mile basic coverage; 5 yr/70,000-mile powertrain, restraint system coverage; 72 mths corrosive perforation protection; 48 mths/unlimited miles roadside assistance; 8 yr/100,000-miles hybrid related components including HV battery, battery-control module, hybrid control module, inverter with converter.